Hell hath no fury like a secretary scorned! Cutting back on Blu-ray and DVD June 12th. 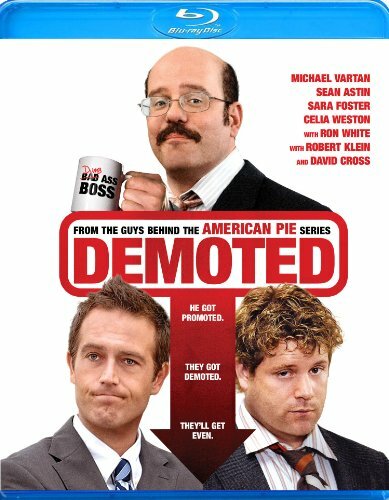 Beverly Hills, CA - On June 12, Anchor Bay Films presents Demoted , the outrageous working stiff's comedy from the team responsible for the American Pie films. Fusing the corporate shenanigans of 9 to 5 with Office Space, and in the same vein as Horrible Bosses, Demoted boasts a star-studded ensemble cast including Michael Vartan ("Hawthorne," "Alias"), Oscar(R) nominated actor Sean Astin (The Lord of the Rings trilogy), Celia Weston (Observe and Report), Sara Foster ("90210," The Big Bounce), Cleo King (Pineapple Express, "Mike and Molly,"), Ron White (Horrible Bosses, Blue Collar Comedy Tour), Robert Klein (Reign Over Me) and Emmy(R) award winner David Cross ("Arrested Development," "Modern Family"). Produced by Parallel Media and FlipZide/Zide Pictures, Demoted gets promoted to Blu-ray(TM) for an SRP of $24.99 and to DVD for an SRP of $22.98. Pre-book is May 16th. For Mike (Astin) and Rodney (Vartan), life is good at the Treadline Tire Company. As topline salesmen, they strut through the cubicles, taunt smarmy underling Ken "Don't Call Me Kenny!" Castro (Cross), hold court at their exclusive lunch room table, and cavort at strip clubs with their boss Bob Farrell (Klein). But when Farrell's unexpected "departure" puts Castro in charge, the guys find themselves demoted and demoralized. Now the target of harassment from the higher ups, Mike and Rodney - with the help of their fellow secretaries - will not only come to appreciate how everyone contributes to the success of a small business, but just might find a way to knock ol' Kenny down a peg or two in the process, proving revenge is best served cold....just like office coffee.